Section 6: Battle City arc (第（だい）六章（しょう） バトル・シティ編（へん） Dairokushō Batoru Shiti-hen) is a story arc in the Yu-Gi-Oh! manga. Seto Kaiba hosts the Battle City tournament, in the hopes of acquiring the three God cards. Dark Yugi participates in order to learn more about his past life. "The Card as Fierce as God"
Seto Kaiba tests his new model Duel Disk and Egyptian God Card, "The God of the Obelisk", against a Duel Machine. 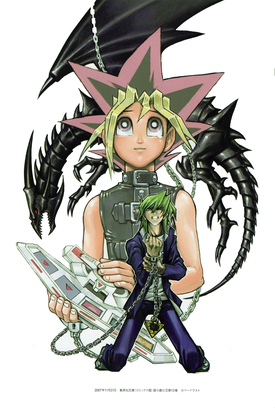 Dark Yugi Duels the Rare Hunter to win back "Red-Eyes Black Dragon" and return it to Jonouchi. Dark Yugi faces a Rare Hunter who use the Dark Magician, Pandora the Conjurer. Marik Ishtar heads to Domino City for the Battle City tournament. While he does so he sends his Doll, who is equipped with "Slifer the Sky Dragon" in the direction of Yugi Mutou. The Doll, possessed by Marik, confronts Yugi, with a Deck that has "Slifer the Sky Dragon" at his call. Dark Yugi continues his Duel with Marik Ishtar, who acting through the Doll. Marik locks Dark Yugi down, giving him sufficient opportunity to Summon his God card, "Slifer the Sky Dragon." Marik Ishtar Summons "Slifer the Sky Dragon", one of the God cards, and his powerful combo drives Dark Yugi into a corner. Marik's "Slifer the Sky Dragon" continues to overwhelm Dark Yugi, who refuses to lose and continues to fight back. Motivated by Kaiba's words, Dark Yugi continues to fight against Marik's "Slifer the Sky Dragon". Thanks to the hint that he got from Kaiba, Dark Yugi sets in motion his infinite combo that goes beyond the limits of God. "Fear of the New Sea!!" "One Card of Life or Death!" Yugi Mutou and Katsuya Jonouchi's Duel, where Jonouchi was partly under Marik's control has just ended and the timer to the bomb that will drop an anchor dragging both players into the sea is about to hit zero. Jonouchi is finally reunited with his sister Shizuka, but still feels ashamed of what he put Yugi through.